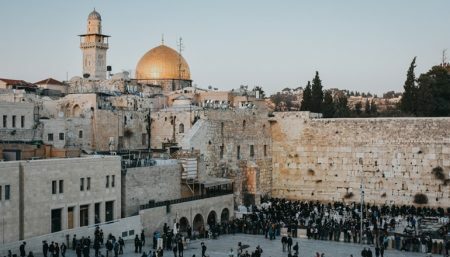 This two day package combines the Nazareth & Sea of Galilee Tour and the Golan Heights Tour with an overnight stay in a tourist level hotel in a Kibbutz. We begin our tour by traveling passed Herzliya and Netanya and then, continuing north along the coastal road parallel to the Mediterranean, we turn inland and drive through the Valley of Armageddon (Revelations 16:6). From here we can see Megiddo. On our way towards Nazareth we visit the Mt. of Precipitation (Luke 4:28-30). We depart Nazareth and travel to the Sea of Galilee (the Kinneret). On the way we pass Cana where Jesus turned water into wine (John 2:1-12). At the bottom of Mount Beatitude we visit Capernaum on the shore of the Sea of Galilee. Here we see the home of Peter and the Church of the Multiplication (Mark 6:30-44). We cross the Jordan River at the foot of the Golan Heights and begin our ascent passing through Hamat Gader. 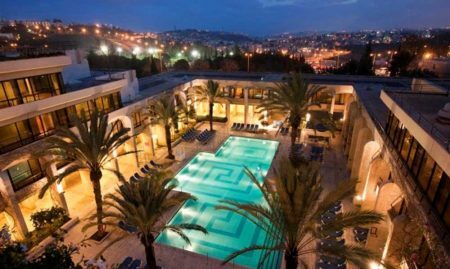 Today Hamat Gader is a popular spa destination just as it was for the Romans almost 2,000 years ago. We continue on through the lush green countryside until we reach the Shalom Observatory. From here we have a stunning view looking back at the Sea of Galilee beneath us. It is easy to understand the strategic importance of the Golan Heights as we see the Israeli city of Tiberias in the distance on the edge of the Sea of Galilee. We travel on to Katzrin, sometimes referred to as the capital of the Golan. This location was occupied as far back as the Middle Bronze Age. Later the Romans, Mamluks, Ottomans and even the French ruled this picturesque city. Excavations have uncovered a village from the Mishna and Talmud periods. The village has been partially restored and we can see the archaeological findings which include a synagogue, houses and an oil press. Here we can also see evidence of former volcanic activity in the Golan Heights as black basalt rock forms part of the landscape. We visit the Golan Antiquities Museum where we see findings from the region and the nearby archeological site. The museum displays artifacts and has audiovisual presentations about the city of Gamla. We learn of Gamla, the historic Second Temple-era Jewish city which has been excavated nearby. We continue to Mount Bental to see what remains of Syrian fortifications. The Syrian bunkers, base and trenches were captured by the Israeli’s in the Six Day War of 1967. From here we can see how close Syria is as we look down on the Syrian city of Kuneitra just beyond the Canadian UN forces which have protected this peaceful border since the cease fire in 1974. Damascus, the Syrian capital is just 50 km from here, and our tour today has probably taken us along part of the route that Saul of Tarsus made on his way to Damascus as described in Acts 9:1.